In this rich and diverse in its geography of the excursion includes various places associated with the Russian spiritual and cultural presence in Jerusalem. First we will visit Gethsemane, where there will be an opportunity to see the Russian Gethsemane convent, in the temple of which the relics of the holy Martyrs Grand Duchess Elizabeth Feodorovna and Nun Varvara rest. Also in Gethsemane will be the opportunity to visit the tomb of Virgin Mary. Then the journey continues to the top of Olive Mount, where the panorama of the holy city of Jerusalem from the viewing platform appears to the travelers. Russian Ascension convent on the top of Olives Mount, reveals the amazing spiritual world of the famous ascetic pious XIX century - the head of the Russian spiritual mission in Jerusalem - Archimandrite Antonin (Kapustin). 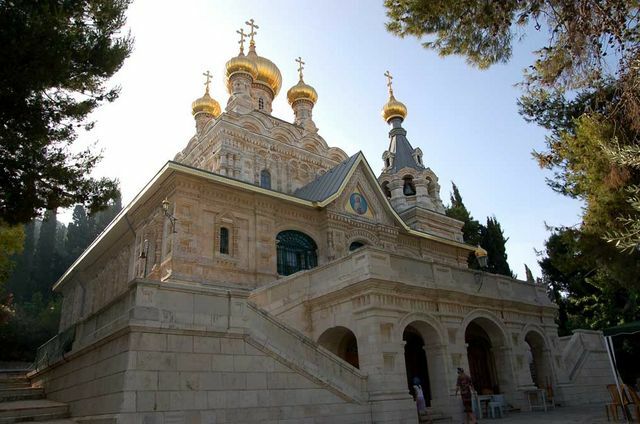 Then the journey continues in the southern direction of the perfect Jerusalem by visiting the Russian women's Gorniy Monastery in a picturesque place known as Ein Kerem. The price for all participants of the excursion on our car with a departure from Jerusalem is $ 400 (with the number of up to 6 people in the car), and $ 550 (with the number of participants from 7 to 15 people). When you leave for a tour from Tel Aviv and its environs on our car, the price for up to 6 people is $ 500, and from 7 to 15 people - $ 750.